Our Europe trip was really decided during a random phone call one evening, last year. And it took us almost 6 months to make that random decision, an actual reality. Well once you have decided you want to go and you have the decent funds for it, what you really need is some amount of decent planning and a good amount of enthusiasm to travel. We went on a trip for 21 days, 6 countries and on a budget of 1,80,000 with an additional 20K personal shopping, per person. Here are some tips on how you can also plan this trip at this budget. This is important before booking the flights tickets, so that you can plan your port of entry and exit accordingly, mix and match the destinations to get the cheapest fare while entering and exiting Europe. Also, chalk your internal travels such that, you spend the least amount of time travelling between the countries. We choose, Paris as our port of entry, traveled to Brussels, Belgium (because that's north of France), onwards to Amsterdam(Netherlands), to Blackforest (Germany), to Munich( Germany), to Prague(Czech Republic) and finally Budapest(Hungary). We flew out from Budapest. Try to go in one direction, i.e. West to East, or North to South and so on, so that at no point you are retracing your steps back to go to a different destination. Lonely Planet : Well this has quite the cliched photos and destinations, but you get a fair idea of what places you want to visit. Trip Advisor : This is like the baap of travel websites. It has awesome reviews on anything and everything that place has to offer. Tripto : Thanks to a dear friend Pooja, who told me about this App. It has accounts of people who have been to all these places and amazing amazing tips. Download it and you wont regret it. The next thing we decided is on the dates. The ideal time to go to Europe is between Apr - Sep. Initially we wanted to travel in May 2017, which then moved to Jun 2017 and finally we decided on a date in Jul 2017. The only reason we moved it is because we were too busy with our work to dedicate proper time for planning this trip. And if you have going that far, the better you plan, the better you save and the more you have fun! We traveled on a Wednesday and our return flights were also on a Tuesday. Don't book return flights from the same destination. Like in our case, the return flights from Mumbai to Paris and back were cheaper, but because as mentioned above, you don't want to retrace your steps back to the same place( If you do that, you would be spending money in Euros and not to mention time, to travel back to Paris from Budapest. Instead pay some more in INR and take the flight back from Budapest). We paid 20K for Mumbai to Paris and 26k for Budapest to Mumbai per person in INR. What we didn't do, but are highly going to recommend -> Try and avoid travelling between Jun - Aug. Agreed the days are the longest and you get more time to explore during the day, but almost everything would be swarming with people and the sun is really really harsh in these places. Would suggest to travel in May or Sep. Cheaper air fare, hostel prices and lesser people! Europe has something for everyone, so try to go with people who have similar interests :-) , else you may end up seeing a lot of things which you really are not interested in. Like in our case, both Priya and I wanted to steer clear of museums. We visited the Louver, but from outside. Agreed we went all the way to Paris and didn't see Mona Lisa(shocker :-|), but for all we know, you can really just catch a glimpse of her from far, and we have like zero clue about whats happening with all the other paintings in there. Yup, you do get the audio guide, but it will cost you more. We instead, spent some time with the Pyramids outside. But, we did stand in the line for 2 hours and spent 25 euros per person to go right up the Eiffel Tower, because we didn't want to miss this view for anything and we didn't regret it. So, this is really a personal preference. We almost had an hour by hour itinerary on what we wanted to see in each city, each day. We split the cities among-st ourselves and then sent it for reviews early on. Like for instance, Priya religiously followed Fox traveler before we were to go and I remember she clearly told me to change the restaurants where we were going to eat and the gelatos which we were going to try (yup, we had researched that as well!, because local food is also a part of the travel), based of some of the shows she watched on TV and those were some amazing places where we ate. One more instance would be -> We also wanted to visit DisneyLand in Paris. And instead of booking the tickets at the park, we booked them in advance and got a discount of total 4k INR on two tickets. Another instance would be researching the different travel cards each city has to offer, and where you can buy them. For instance, we bought a Paris travel card for 4 days at a cost of 22 euros per person, which gave us free access to the trains, trams and buses in four zones of Paris (yes this covered Disney land as well). Travelling by uber /taxi is a big no and no for a budget trip and really you can't compare the hustle bustle with the local commuters against a boring lonely taxi ride! Apart from Lonely Planet, trip advisor and Tripto, we also used Wiki travel, local blogs(just type backpacking Europe and you have tons of stuff to read) and of course Fox traveler channel. Trust us when we say this. Staying in an airbnb acco with your host who is a local or in a hostel room with 4 other people from different nationalities, comes no where close to a lonely hotel room. Want one more advantage, COSTS way way less! We budgeted for 2K INR per person per day, and we ensured we didn't cross this. and save on money. But Do have one meal outside, because as we said before local food!!! Mix and match between airbnbs and hostels. We did this, but we stayed in airbnb for the first half of our stay and the remaining part were hostels. Airbnbs give you more privacy, which we craved for, near the end. Hostels which offer free breakfast or atleast an open kitchen, again to save costs. Except Munich, all our hostels had free breakfast/open kitchen. Hostels which offer free late checkin. We ended up paying 5 euros for a late checkin and we were not too happy about that! And most importantly, check the location as well (apart from the reviews) of your airbnb and hostel. You don't want to be spending time and money in reaching your acco daily. Try and choose a place which is near to the city centre. Its safer as well for women travelers. Carrying our stupid big bag-pack and our another stupid small sack between the countries was like our lowest point on the trip. Instead do what all the Chinese people did (well they were so many Chinese around us at almost all destinations, that at one point we really wondered if there any of them left back in China! Man these guys travel and how), travel with one big suitcase and a tiny little purse. Almost all of Europe have escalators if you worried about the stairs. Please do this and you will thank us later. Well, I am really going to wrap this one up now, to avoid more frying of my brains(whatever is left of them) now. If I forget something, I will either edit this post, or add it to the following country wise posts. Next up, how to apply for a Schegen Visa! To break free of the shackles constructed of guilt and remorse. Glide across an expanse of greens, and the barriers called mountains. To Breathe an air not contaminated with emotions of love or antipathy. To not fall in the allure of this new shackle called companionship. To smile gratifyingly, and the embrace the serenity finally! 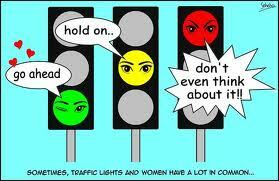 Come school, and we were taught the meanings of the colors on the traffic signal. It was basic and simple. ﻿﻿Come Pune, and you drive for 100 meters and then bam. It hits you. It hits you, how your parents were cheated out of their money by the schools. None of those bookish terms and traffic rules applied to the Punekars and this budding city. Because the city had made some of their own! Astonishingly everybody from the school kids, to professionals, to old kakas, to aunties and to the traffic police men are aware of these special rules, and abide by them no matter what. And if fate feels like it and you land up on the roads in Pune, don't be surprised with yourself. It would just be a matter of days, before you also start following the special rules, while the school rules are busy escaping your memory. Adaption; remember from science in school? At least, something they taught was right! Well ok, so before I explain the rules, here are few characteristics. They are tough to follow and it all comes down to Darwin's theory. The survival of the fittest. And most importantly they are dynamic, prone to change as per your vehicle position in the signal. But again isn't changing constant? And now the rules! Check your vehicle position and apply wherever applicable please. Just turned green: Try to ignore it first, and then get the kid out in you. Start and stop your vehicle, you know, just for fun! Green with a timer of 60 seconds: Admire all the pretty girls' figures on their scooters and activas. (Of course you can't see their faces!! Duh, it is a crime to drive a 2 wheeler without a head and face scarf if you are a girl in Pune). Ensure the speed is nothing above 20kms/hr. Green with a timer of 30 seconds: Continue the admiration, and keep the speed below 30kms/hr. Please practice the combo before the real test. Also don’t forget to catch the abuses of those behind you. Bask in them but act nonchalant. Green with a timer of 10 seconds: Ok enough of goffeying up. Chuck the gals, accelerate the vehicles to a good 60kms/hr. Ensure your bikes and cars are well serviced, to make this hyperbole (or is it parabola?) acceleration from 20-30 to 60-70 kms/hr in 10 seconds. Amber: Drive with full gusto and a speed of 80km/hr. Focus and dedication are of utmost important here. Applying the brakes on the sight of an oncoming vehicle from the opposite direction or on the sound of a police whistle is a sin and looked down upon. Red: Keep up the speed of 80kms/hr till a vehicle almost hits you. Ensure you are well conversant with the tactics of twisting and gliding styles of bike riding. If in a car, maintain a ice cold stare on your face and act as if you are king of the world and you will glide through the mess(which by the way you just created). Just turned green: Practice your tabla skills on the horns. This is to ensure people know, you want to get out of the signal even if you have five to six vehicles ahead of you. And to ensure, even if everyone in front of you has noticed the green light, you want to pretend to be the only intelligent one who has. Green with timer of 60 seconds: Abuse to your heart's content at the vehicles ahead of you. Green with timer of 30 seconds: Continue the abuse. Also increase your vocab by listening to the vehicles next to you, and put that to use immediately. Green with timer of 10 seconds: Don't panic. You are destined to cross the signal and you will. Never lose hope. Amber: Ok, you can lose hope now. Red: Time is money. Start revising your abuses. If you want to turn right: Ensure you place yourself on the leftmost lane of the road. As soon as the signal for Straight goes green, start your indicator for right and block the entire road. Guilt and remorse on the face will make you lose your brownie points. Keep going right, because you know, indicator to diya tha maine! If you want to go straight: Ensure you place yourself on the rightmost lane of the road. As soon as the signal for the right turn goes green, smirk blissfully and don’t budge an inch. All the cars behind you who want to turn right, will honk and cringe and abuse, and of course all that would be music to you. Because jo bhi ho, if I can’t go, the world can’t go! Other rules which are not on a signal but apply to the road! If you see a 2 wheeler woman driver, with her feet touching the ground from both the sides of the activa, that's allowed. Because her feet don’t reach the ground and Oh, she still wants to drive an activa. The entire journey has to be and will completed, with both foot firmly dragged along the road. If you see a woman on an activa, who has just hit an indica from the behind, but is just pulling her bike back and driving away, then that's allowed. No matter who strikes whom, the woman cannot be at fault. If you are taking a reverse which will just take 10 seconds, and you have couple of more cars patiently waiting for you to finish, 4-5 two wheelers will still trying to zoom past from the rear, making you also halt your backward journey, but then that's allowed. Two wheelers are always busy even though they would get home and just flop onto a huge sofa. And lastly, if you see a two wheeler stop right on the middle of the road, because he has to take an important(?) call, that's allowed. Because doesn't matter if you jam right into him, he would prefer that, than to face the GF's enquiry commission. My Prince Charming - Really? All tall and exquisite, a smile so disarming. To resign itself to this thirst, so marvelously deluding! But does the gullible heart relinquishes? Oh not so early! For the mirage of love ahead, is still flickering. The anxiety finally enters, after an infinite era of waiting. But resigns when grasps, the path so long to recovery. Through the windows, the allusion of him is still thriving. And gladly accepts this time, just the sun rising. This is a travel series about my times in London. You can read the first part here. Once outside London Heathrow, always opt for a non black cab. You can find local cab numbers on the net which are very reliable. My colleague had already booked one for us. The difference between the two is, while a local cab would cost you 25 pounds for a distance of 15 miles, a black cab would cost you 50-60 pounds. Although the company pays for the travel costs, there was no way a 50 pound taxi bill would be re embursed by HR. For the first month, a guest house is provided in Wembley (north London) which is a 2 bedroom hall kitchen flat fully furnished and equipped flat for every associate. After a journey of 45 minutes we reached the guest house. Surprisingly I felt no jet lag, considering it was 1:30AM in India. I was just plain excited and upbeat. Soham was my colleague, who I was too replace. He was a very skillful resource, and my client had high regards for him, so I knew I had very experienced shoes to fill. But I was looking forward to all the hard work, and Soham being my friend, I knew would help me a lot. He had come to receive me at the airport and took me safely to the guest house. He had even purchased a SIM card for me. Purchasing a SIM is very easy in London. You can simply go into any of the grocery stores and buy a prepaid SIM for the rates of 5,10,20 pounds. I always used a Lebara SIM, because India calling was very cheap. You can choose your SIM on the basis of the country you belong to. Sudha was the person with whom I was to share my guest. She was 4 years my senior and 2 designations higher, but one look at her, and you would feel she was just out of her college. Petite and extremely thin, she looked like a girl not too friendly, but she did greet me with a smile. Unlike most London roomies I have heard about, she didn't retreat to her room, but instead stayed with Soham and me, till the time he was there. Both of them had made arrangements for my dinner, which felt so good. It didn't feel lonely anymore. Sudha, was there on a business visa, so she was leaving in a month's time. 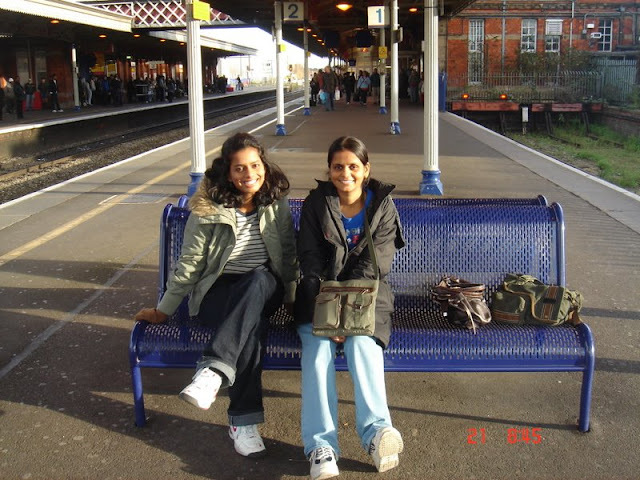 And although I had the luxury of 6-8 months to discover London, Sudha ensured I was only sight seeing and looking at places all over London on all four weekends that I shared the guest house with her. Sudha and me at the Slough station, waiting for the national express in the cold! You loved me, yet you had your own dues. You suffocated, asked for freedom from this servitude. You, the defeated continued to stay put. You for my happiness, tagged alone no clue. You, all along developed a hatred, deep root. For the naive and romantic me, only always knew. How love was unconditional, a feeling too delicate, a feeling so painfully true. To grant you the freedom, you endlessly pursued. With traces of wilderness and abundance of solitude. But the conscience is what sighs and is finally rescued. PS: I wrote the poem at 2 last night and posted it. Today morning, I felt how silly it was, and it was just the lack of sleep and a mind filled with unnerving thoughts which bought out those words, so I deleted it. Thank you Saru, because you felt it was worth posting, so now I repost it. I wanted to write about my times in London for a long time, and wanted to make this a series. Connie who blogs at bhulbhulaiyan has traveled the world and how and has all travel encounters on her blog. So when she asked to write a guest post for her, I thought, what better way to start this series! Thank you Connie. So here it is, my first guest post and the first part of this series. Hello people! Welcome to my page. I write about my personal experiences, travel and humor. The intent is to capture my thoughts at this moment of time, so that there is something I can turn back too in future and feel these perky times again. Trivia for the month: Keep smiling, the world would think you know something they don't!